We had heard good things about this restaurant/tapas bar and after an early show at the Ritzy on Saturday we went along for a snack. We certainly were not disappointed by the food, the ambience or the really helpful staff. At the outset we want to say this is a gem and you should visit. As you may aimlessly wander around Pop Brixton we thought we would give explicit directions. Pop Brixton is a collection of large storage containers offering food, drink and the occasional piece of jewellery or clothing. Donostia Social Club is on the upper level and can only be approached from the set of stairs on the right immediately after the entrance. Donostia is the Basque name for San Sebastian, a town with more Michelin stars per capita than anywhere else in the world. 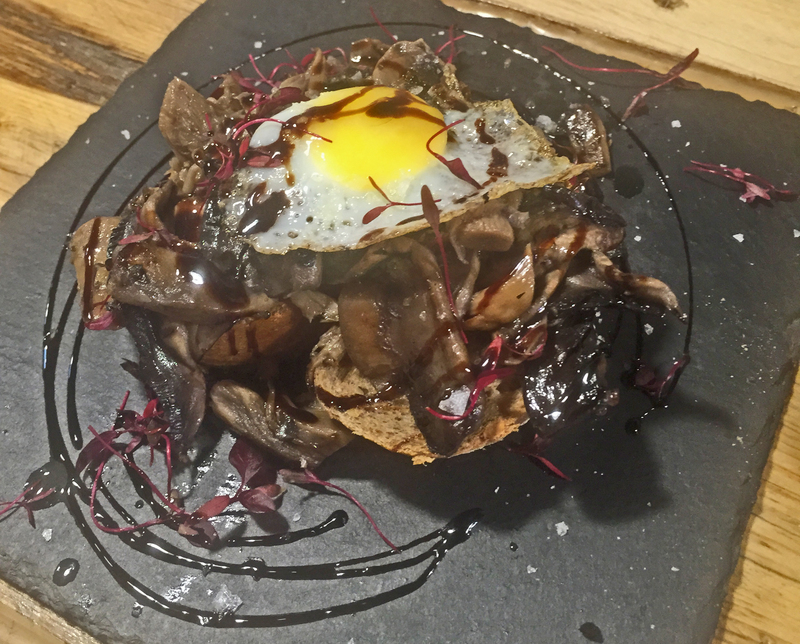 It is also famous for Pintxos – large sized tapa and this restaurant provides small and larger ones to tempt the palate and soak up the heavy reds or cool sherries. The bar where we sat offers a sanctuary in busy Pop Brixton. You can contemplate the menu and chat to the waiters. It is long and thin. Even when busy there may be seats at the kitchen end. You can also sit outside or at high tables inside. This is definitely built for the summer and any cooler months which makes it stand out from the crowd. The menu has snacks. 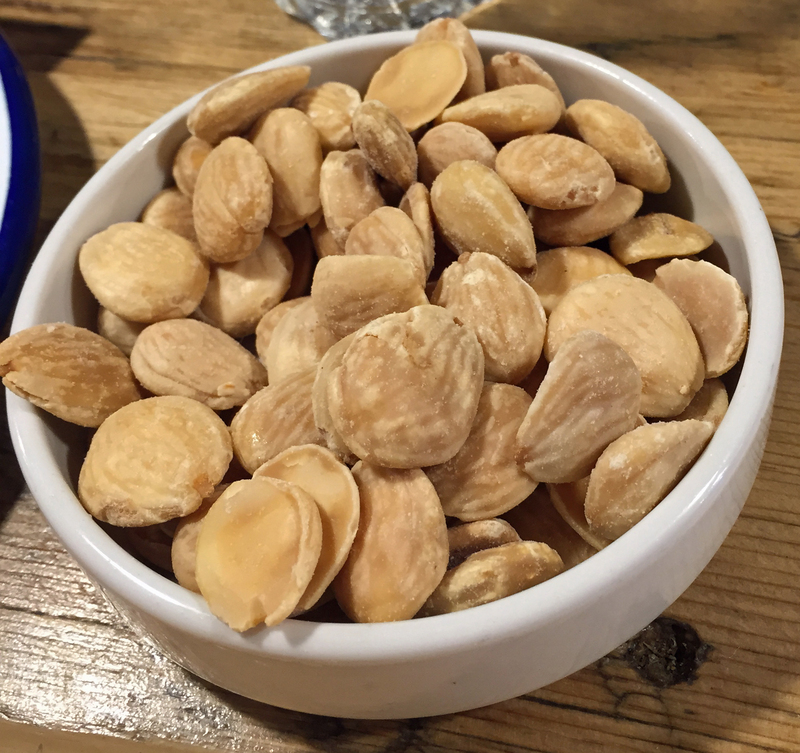 The usual ones to go with a drink (olives, dried broad beans, large salted almonds etc.) 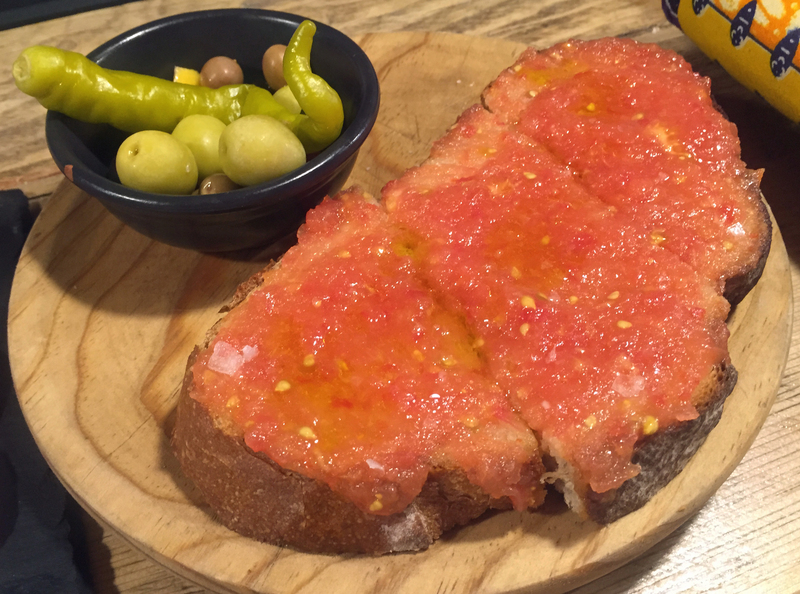 and then they have plates of cheese and/or meat and one of our long-term favourites – pan con tomate. We chose a plate of meat and the almonds with the pan con tomate before we were tempted by the tapas menu. The main part of the menu is divided into meat, fish and vegetables and each is a tapas sized portion. 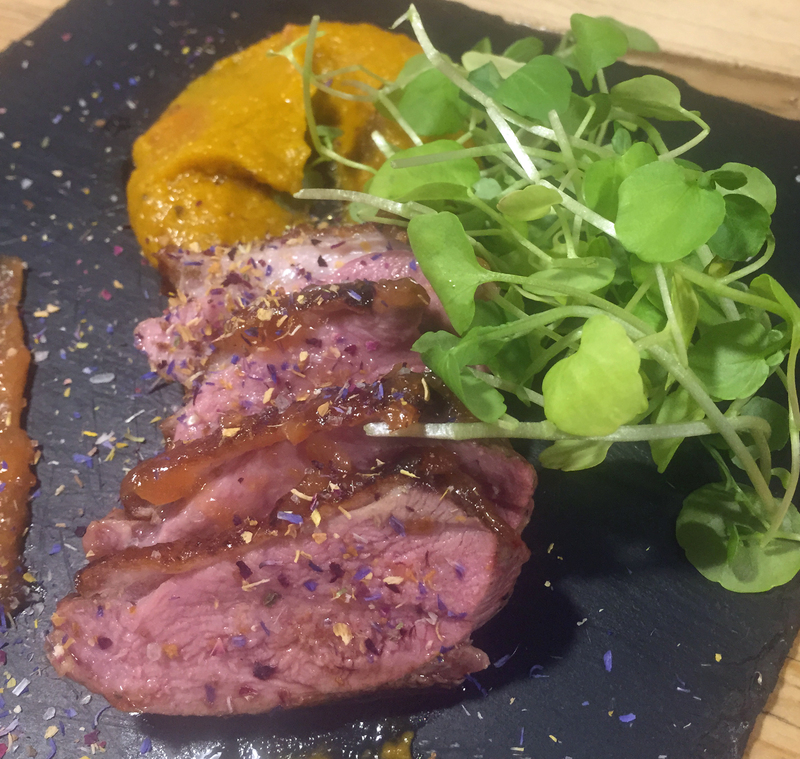 We chose duck, piquillo peppers and a daily special, truffled mushrooms. We failed to take a picture of the menu and it does change, so do not rely on the online version. Everything was wonderful and we have lots to compare it with as we are frequent visitors to Spain. The meat consisted of three “sausages” – chorizo, salchichon and catalan fuet (a thinner more meaty and less fat type of salami). It came with bread and olives. We really need to point out the olives – large manzanilla green ones, small lemony ones, meaty black ones with lemon pieces. 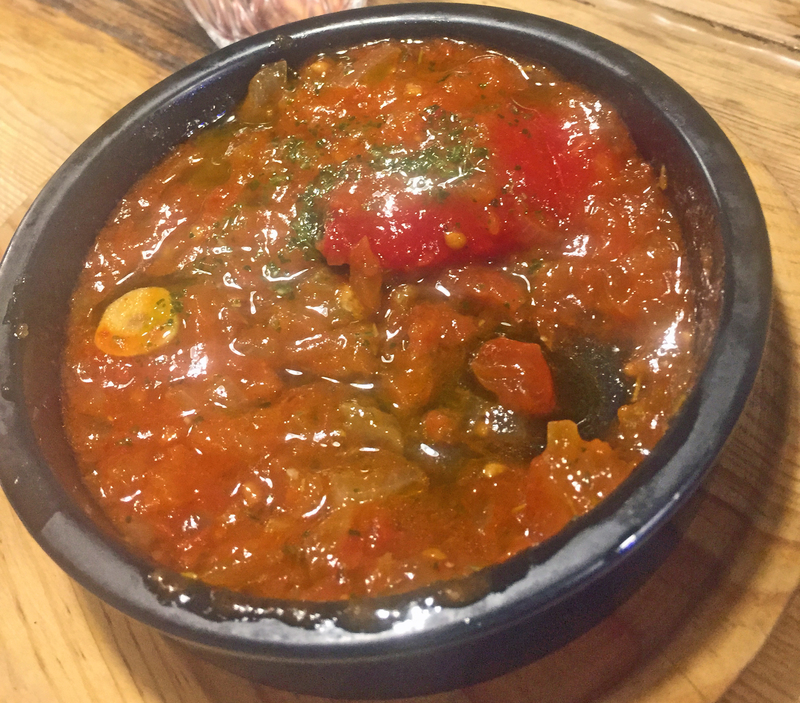 We have never had a mixture so good and we often complain that many of the Brixton restaurants fail on this very small item. But onto the other dishes. The pan con tomate was certainly up to our high standards. It all depends on the quality of the tomatoes and the olive oil and they had it just right. The mushrooms come on pieces of bread too and were perfectly seasoned although being greedy we wanted a bit more truffle. But there were two other stars of this show (apart from the olives). First the piquillo peppers which are stuffed with smokey aubergine and picos blue cheese and surrounded by tomato sauce. Although this didn’t come with bread we had lots to wipe up every inch of sauce and the peppers were sweet and salty with a hint of the smokiness – heaven. The duck was the other star. When we cut into it we thought it might be a bit tough but that was the fault of the knives. It was again seasoned well and came with a vegetable puree (see picture). There was a chocolate desert but we were too full to even contemplate it.